If you want to enjoy superior comfort while riding on hills, then you might have to get the 26-inch genesis v2100 dual-suspension bike. 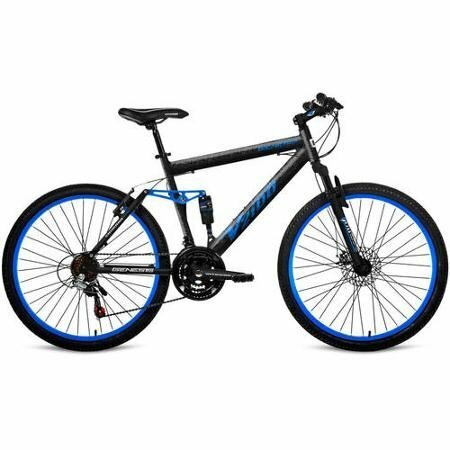 Featuring a dual-suspension frame, this men's genesis bicycle is very hill-friendly, and offers you a smooth riding experience even on rough terrain. The suspension fork of this genesis mountain bike ensures you don't feel the bumps on the road. The shaman gearing system of this bicycle makes shifting between gears a breeze, thus letting you move up and down hills effortlessly. Sudden braking will now be safe, as this genesis v2100 dual-suspension bike features a front disc brake and a rear v-brake. Long-lasting tires provide a strong grip over rugged paths. Those who love off-road cycling will enjoy the genesis v2100 bicycle.